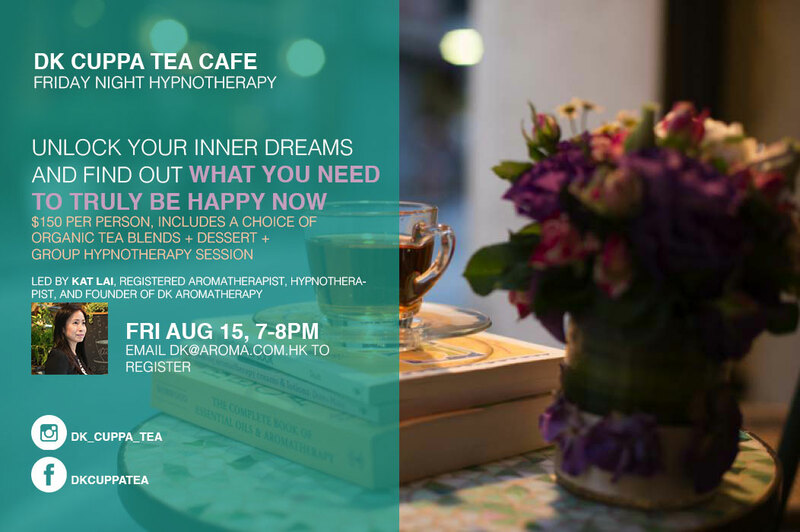 HKD$150 Hypnotherapy @ DK Cuppa Tea café to Unlock Your Dreams: Join aromatherapist and hypnotherapist Kat Lai at the newly opened DK Cuppa Tea café in Soho this Friday Aug 15, 7pm-8pm for a group session to tap into your subconscious! HKD$150 includes the session + an organic tea set with dessert. Kat is the aromatherapy consultant and Certified Clinical Hypnotherapist. She mentioned that the human mind is incredibly powerful. Kat: Hypnotherapy is the use of therapeutic techniques while in a natural hypnotic state of mind. It is an effective, rapid, and inexpensive form of holistic therapy. DK: How could we enjoy it? Kat: Hypnosis is a natural state of mind. We spontaneously experience this state many times in our lives: right before or after sleep, while daydreaming, or while relaxing and forgetting ourselves. DK: What does it do to us? Kat: Hypnosis accesses the subconscious mind. Through the subconscious we can skillfully engineer changes in our emotions, imagination, memory, automatic body functions, habits and intuition. Hypnosis can be a very personal, profound experience. You can discover a deep sense of physical relaxation while your mind remains active and alert. Hypnosis allows you to access and harness that power to quit smoking, lose weight, erase fears, phobias, anxiety, panic, eliminate negative habits and emotions, build self esteem, enhance performance, and much, much more. Hypnotherapy can help you achieve a balance between your mind, body and spirit, and live a happier, more satisfying, and peaceful life. Hypnosis can help you literally create a better you!